Former ARCA/CRA Super Series late model champion Travis Braden (No. 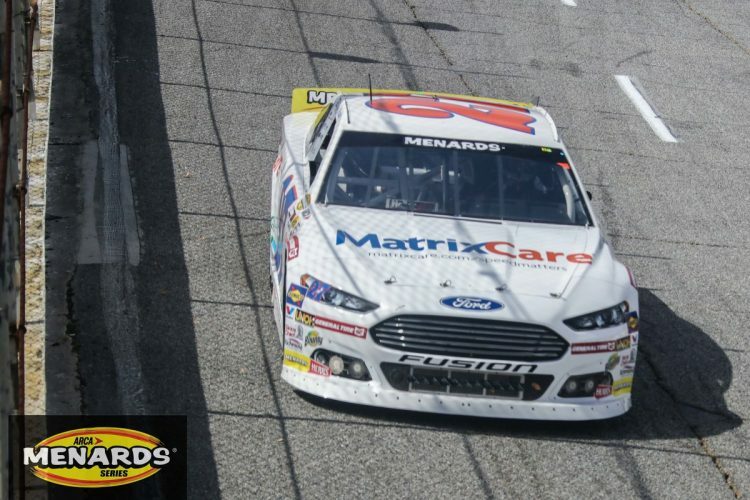 27 MatrixCare/Consonus Health Care/Liberty Village Ford) started his ARCA Menards Series career with a victory in his series debut at Lucas Oil Raceway in 2015. Driving a family-owned car on a tight budget, Braden finished second in his second series start at Kentucky later that season. Despite impressive performances, his small team couldn’t secure the funding to run a full season in the ARCA Menards Series so Braden, then a student at West Virginia University, ran a handful of races while staying active in super late models. But by the end of 2015, Braden’s career was at a crossroads. Braden’s father Don is a towing service operator in their hometown of Wheeling, West Virginia. Despite owning a successful business, the family’s ability to keep Braden on track was waning. Braden had thought ahead, earning a dual degree in aerospace and mechanical engineering from WVU, but wasn’t yet ready to give up on his dream to be a racecar driver. Braden made the move to another late model team in 2016. He scored an impressive last-lap win at the 2016 Winchester 400 at the ultra high-banked half-mile in eastern Indiana, which put him back in the national spotlight. Opportunity knocked when RFMS Racing owner Don Fike was looking for a driver to evaluate his racecars in 2017, notably at the very same Winchester Speedway where Braden had found success in the late model. Braden qualified tenth and ran up front all day long in that race at Winchester, finishing fourth. It was his fourth top-five finish in seven ARCA Menards Series starts to that point in his career, and it opened the door for three more races at the end of the season. Braden fit in with the small RFMS Racing group, led by long-time ARCA crew chief Dan Glauz. When the 2018 season opened, Braden had been selected as the team’s full-time driver. He relocated to the Indianapolis area to work in the shop full time with the team and despite a budget a fraction of the teams he was competing against, Braden scored four top-five finishes and eleven top-ten finishes, including back-to-back top-four runs at Springfield and Berlin. Despite virtually no experience on dirt, he was in contention to win at DuQuoin before contact late in the race while leading relegated him to 15th at the finish. The “little team that could” started 2019 off with a renewed commitment from their sponsors, new uniforms for the crew members, and a renewed attitude. It has paid off handsomely as Braden is one of only two drivers with top-ten finishes in both ARCA Menards Series races so far, an eighth at Daytona and a tenth at Five Flags. As the series heads to Salem Speedway for the third event of the season, Braden is optimistic for a chance to run for the team’s first top-five finish of the season. Salem is a sister track to Winchester, where so much of Braden’s success over the years has happened. And despite a 14th-place finish there last April, Braden rebounded to finish fifth on the high-banks at Salem last September. While the season has started with numerous positives, the RFMS Racing team was touched by tragedy on March 14 when long-time crew member Jason “Red” Morris lost his life in a traffic accident in Ohio. Braden and his teammates will be racing in Morris’s memory at Salem and throughout the 2019 season.